Sound dampening or sound barrier products add mass to a wall, ceiling, floor or enclosure, serving as a highly effective soundproofing solution at an affordable price. Soundproofing barriers, including our mass-loaded vinyl barrier, are typically installed on the studs or joists to reduce airborne sound transmission between the source and the target. These sound absorbing materials are easy to install and make DIY soundproofing a simple process anyone can accomplish. Choose from our wide selection of lead barrier, mass-loaded vinyl or sound control blankets and soundproofing mats to find the best solutions for your home or office studio. 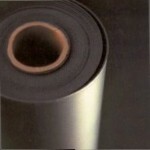 We also have mass-loaded vinyl seam tape to help reduce sound leaks between sheets of mass-loaded vinyl barrier. 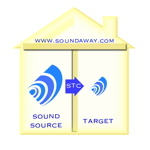 Sound Transmission Class is the weighted average of the transmission loss between the sound source and the target. It is a rating assigned to a material or an assembly of materials to represent the decibel (dB) reduction across the frequencies ranging from 125 Hz to 4000 Hz. The difference between the sound source and target, in decibels, is referred to as the transmission loss. Measurements are taken at 125, 250, 500, 1000, 2000 and 4000 Hz to arrive at the overall STC rating. SoundAway Mat,1/2" x 4' wide, is a high density, soundproofing closed cell foam designed to block and absorb sound. SoundAway soundproofing Mat is frequently used to line interior panels in planes, boats, recreation vehicles, and cars. SoundAway Mat, 2" x 4', is a high density, soundproofing closed cell foam designed to block and absorb sound. Maximum sound reduction across a wide range of frequencies. 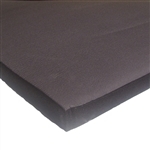 SoundAway Mat, 2" x 4' wide, is a high density, soundproofing closed cell foam designed to block and absorb sound. SoundAway Mat PSA, 1/4" x 3' x 4' sheet, is a dense, soundproofing closed cell foam designed to block and absorb sound. Includes a pressure-sensitive-adhesive (PSA) backing to simplify installation. SoundAway Mat PSA, 1/2" x 3' x 4' sheet, is a dense, soundproofing closed cell foam designed to block and absorb sound. Includes a pressure-sensitive-adhesive (PSA) backing to simplify installation. SoundAway Mat PSA Sheet, 1" x 3' x 4', is a high density, soundproofing closed cell foam designed to block and absorb sound. 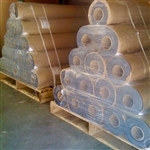 SoundAway Barrier MLV Rolls, 1/8" x 4' x 25', 15 rolls per pallet, are a dense, 1 pound per square foot, flexible, soundproofing mass loaded vinyl noise barrier highly effective in a variety of noise control applications. SoundAway Barrier Rolls offer an effective solution to block voices and reduce noise.